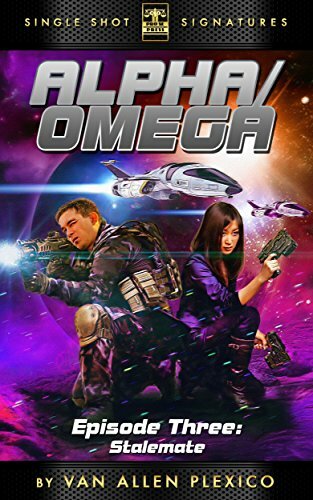 Pro Se Productions announces the release of the third episode of ALPHA/OMEGA, a serialized near-future space opera adventure from award winning author Van Allen Plexico, author of the Shattering and the Sentinels series. This new chapter is available as an ebook for only 99 cents! A peaceful, international scientific research base orbiting Alpha Centauri-A. A military coup aboard a starship headed to resupply that base. A terrible, dark secret concealed on the moon of Amphion. just jumped head-first into a hornets’ nest of cosmic proportions. But—are they the good guys in this story… or the bad? ALPHA/OMEGA is a Pro Se Single Shot Signature Series, a serial novel being released as individual digital episodes. Featuring an exciting cover and logo design by Jeffrey Hayes and formatting by Antonino lo Iacono, ALPHA/OMEGA EPISODE THREE: STALEMATE is available now for only 99 cents at Amazon at https://www.amazon.com/Stalemate-Alpha-Omega-…/…/ref=sr_1_2… and for most digital formats via Smashwords at https://www.smashwords.com/books/view/699369. NEW PRO SE SINGLE SHOT SIGNATURE SERIES SWINGS INTO THE OCCULT! ‘JOHNNY RICH’ DEBUTS FOR 99 CENTS! SUPER HERO ACTION DOWN UNDER-SECOND ’AUSTRALIS INCOGNITO’ STORY DEBUTS FOR 99 CENTS!